I first saw photos of Mesa Verde in a social studies text book. I was a young second grade teacher, and the thought of the cliff dwellings at Mesa Verde fascinated me. I didn’t just want to teach about it, I wanted to go there! When Ed said that Mesa Verde wasn’t that far from the Grand Canyon, I told him to make it part of our trip. 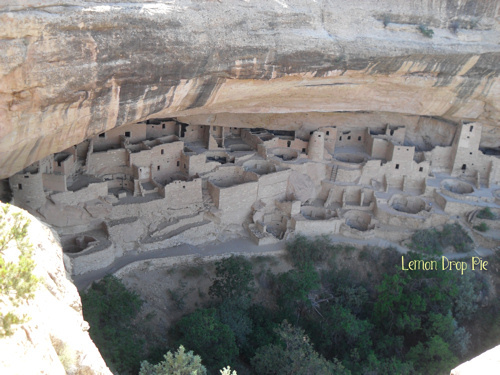 Ed had never really heard of Mesa Verde before, but he humored me and included it in our plans. 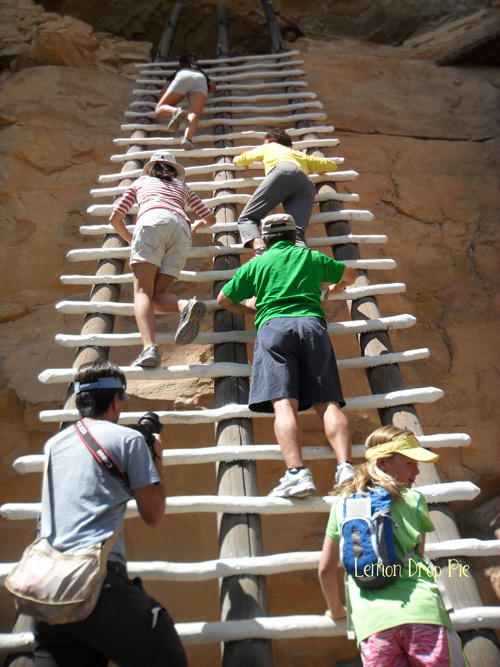 The morning of our Mesa Verde tours, we approached Cliff Palace in complete awe. Over a century ago, two cowboys had been searching for lost cattle in the canyon, and what they stumbled upon was truly amazing. The rest of the world agreed with them! As I reached in my purse to take out my camera, I had a sudden realization. I had left my battery charging in the hotel room! The night before I made sure I had enough memory on my memory card and wanted to make sure my camera didn’t run out of power, and then I totally forgot the ! @#$% battery! This was a place I’d been dreaming about visiting and now that I was finally there, I couldn’t take pictures! I was so mad at myself. My darling 8 year old daughter came to the rescue. Her camera was in the car, so I was able to take pictures after all. 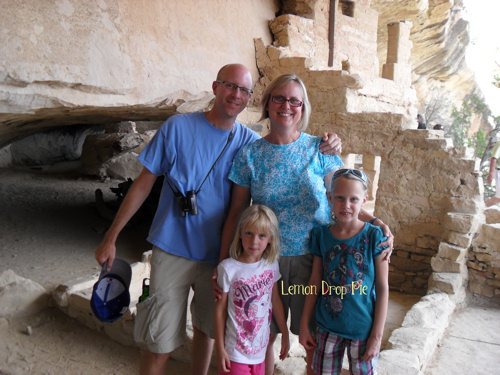 Mesa Verde is such a great place to explore. You can take self-guided tours or go on ranger-led tours, which I highly recommend! We squeezed through tunnels and climbed up ladders, and explored the ruins left over a thousand years ago by an amazing group of ancient people. Squeezing through a cliff side to get to a ladder. What did you do during your summer? Gretchen and I want to know! Tell us in the comments, or link up your summer post below! On Monday, I’ll have a new prompt for next week. Be sure to check in and see what we’ll be writing about! Wow! Such a cool trip! I would love to see that! It was really a neat experience! Thank goodness your daughter had a camera. The Cliff Palace looks amazing! In the first photo, it almost doesn’t even look real. More like a miniature model made for a movie. I got anxiety thinking about no camera. Your daughter to the rescue! This is up there for me big time, on places to visit. Beautiful! I first thought the top photo was actually up side down, but when I looked closely I realised that it was the right side up. Yes, it does look upside down, now that I’m looking at it again! The buildings are tucked into the side of a cliff; my pictures just don’t do it justice! 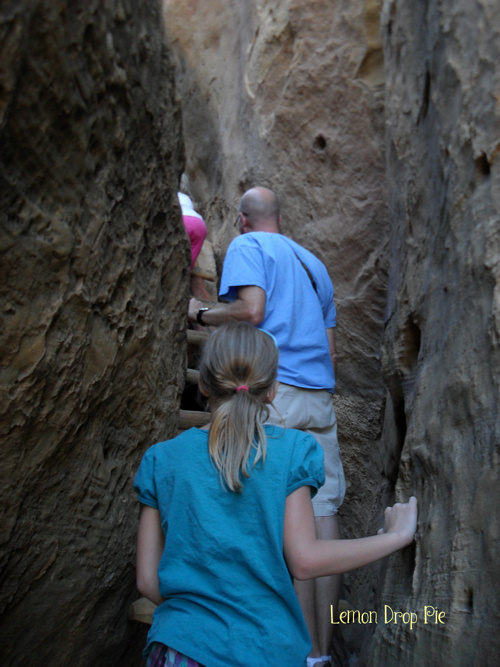 Mesa Verde was one of my Daddy’s favorite vacation destinations. He loved the history and the beauty of it. I’m jealous! And I can’t wait to see what you decide to post for next week’s Spin Cycle topic! Let’s email.